Crush the garlic and chop the leek, onion and shallots. Melt the butter and oil in a large pan on a low heat, add the garlic and sage. Add the onions, season with salt and pepper and gently cook them for 50 minutes covering the pan with a lid for the first 30 minutes, stirring occasionally so nothing sticks. Once the onions are soft, add the stock and bring to the boil. Reduce heat and simmer for another 10 minutes stirring occasionally. 24 members have added this recipe to their cookbook. 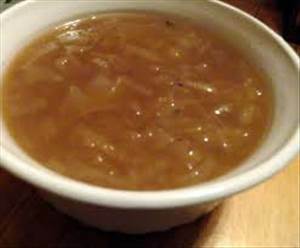 There are 121 calories in 1 serving of Onion Soup. Calorie Breakdown: 49% fat, 44% carbs, 7% prot.